With the savage winter snows swirling about the buildings here at the dockyard, it encourages us to find tasks suited to the indoors. Although I am charged with making a regular inspection tour of our squadron at anchor here in Navy Bay (and do so on a weekly basis), I am mostly involved in endless accounts. As I have already completed this week’s round, and find the pile of paperwork has diminished to an acceptable level, I now have time to write to friends and colleagues on elements of Naval warfare here in the north. Indeed, between the weather and the general idleness of many of the officers, we look to social pursuits to fill our time. It has been a custom for a generation in these parts, to have as a mid-winter distraction, a Ball to celebrate the Queen’s Birthday, and this winter was no exception. Sir James, upon noting the value of said Ball and the like, decided to dine all his senior officers in to take measure of their Spirits and to boost them as necessary. You may recall that our Autumn just past was one of great difficulties and equally great disappointments. As the dinner was to gauge the moods of the officers present, the normal ban on discussing matters professional was lifted and so the talk became quite spirited. One topic with much heated discourse was on carronades versus long guns, and I know you would have been quite interested and involved, had you been present. It is perhaps not well known that our squadron has a preponderance of carronades as opposed to U. S. Commodore Chauncey’s more balanced armament. 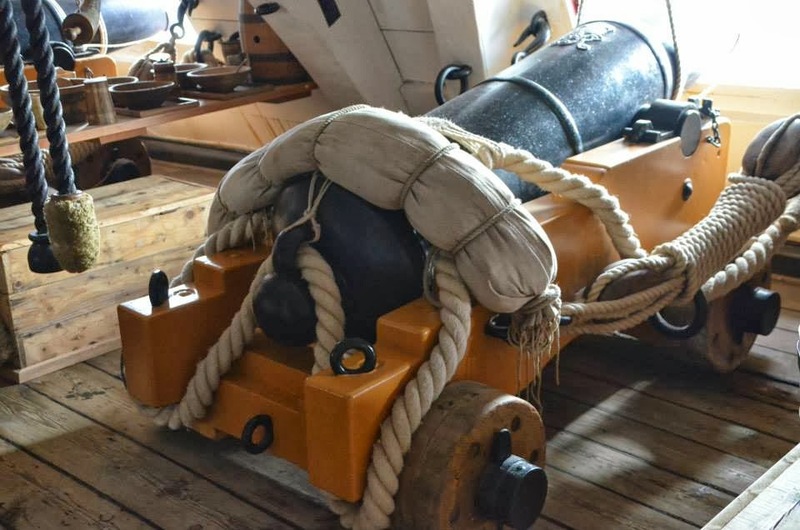 As you know, for many years, we have been removing 4 and 6 pounder long guns for the smaller vessels in the Royal Navy, and replacing them with 12, 18, 24 and even 32 pdr carronades. Our sloops and brigs on the lakes reflected that practice. We even have some 68 pdrs! Indeed, since most of our encounters up to this point were at close quarters and small warships are not stable firing platforms, closing the range seemed the only way to ensure hits. It made perfect sense. I took the position that carronades are most useful with our ships and even postulated that this would be the weapon that would prevail. “Why would you say that?” asked Sir James, inviting me to continue. “Well Sir, I base this on my experience with the North Sea Fleet when I was Sailing Master aboard HMS Director (64), Captain Wm. Bligh. “Ah yes, Sir Henry was always mad for carronades!” said Sir James. “Well, although the 42s were replaced with 32 pdrs early on, she could still boast a broadside of 1400 lbs! 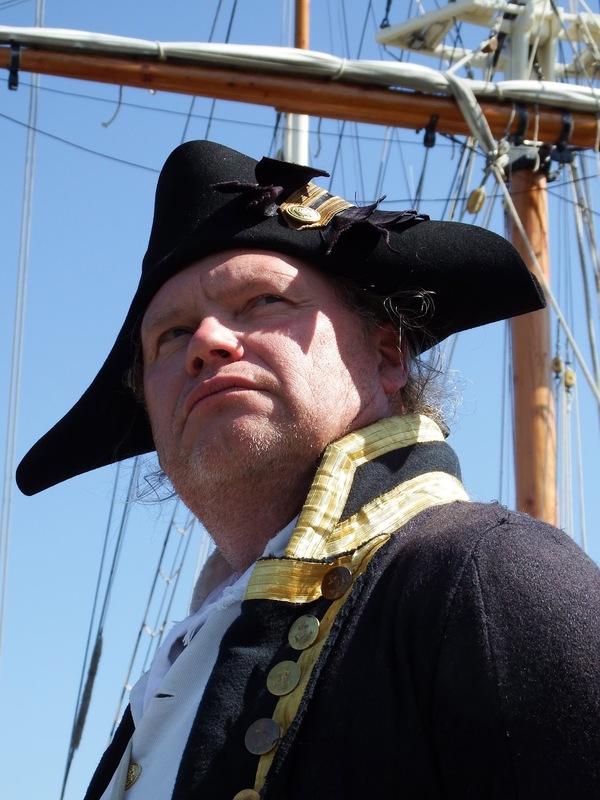 “Have you ever heard of Commander John Wright and HM Sloop Vincejo?” he asked me. He continued, “In the year ’04, armed with only 18 pdr carronades but for her two chasers, she was surrounded in Quiberon Bay by French gunboats and pounded from range, compelling her surrender! “No Captain, it’s not short range carronades we need, no matter the size of their shot, but bigger guns with longer range, miles of range, so you can hit the enemy as soon as you can see him! And with explosive shot, to increase the damage! That’s the future of Naval gunnery!” he stated with great enthusiasm. “Hear him, hear him!” came the near simultaneous roar from the assembled officers. Then, staring intently down the table to catch the eye of the “vice”, he nodded. There is great zeal for the service and we can’t wait for the lakes to open up so that we may again attempt to fight the foe! But only at close range until the Commodore’s long guns arrive.. I trust all is well with you and Acasta? I wish you good hunting, my friend! Ship's data and some history comes from Rif Winfield's British Warships in the Age of Sail, the 1714-1792 (Rainbow and Director) and the 1793-1815 (Glatton and Vincejo) volumes. The service history of Sir Henry Trollope GCB comes from Volume 3 of A Naval Bibliographical Dictionary 1849. 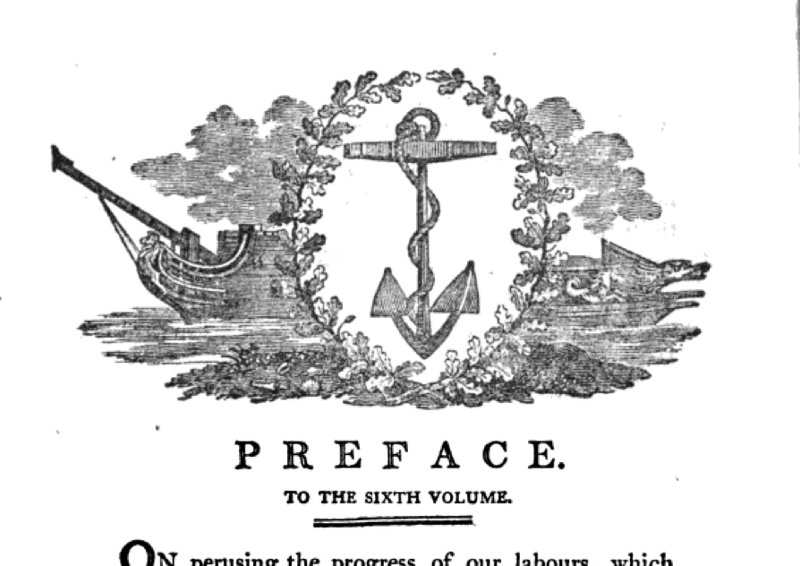 There's a footnote on the career bio of Captain George Barnes Trollope about his esteemed half-brother, the late Admiral Sir Henry Trollope (deceased 1839). Curiously, the footnote above it is for Lieutenant Robert Trist. Lieutenant Trist was a Master's Mate and passed lieutenant aboard James Yeo's sloop of war Confiance (rated 18 although she was armed with 22 carronades!) and was confirmed Lieutenant due to heroic deeds he committed in 1808 while serving under Yeo. 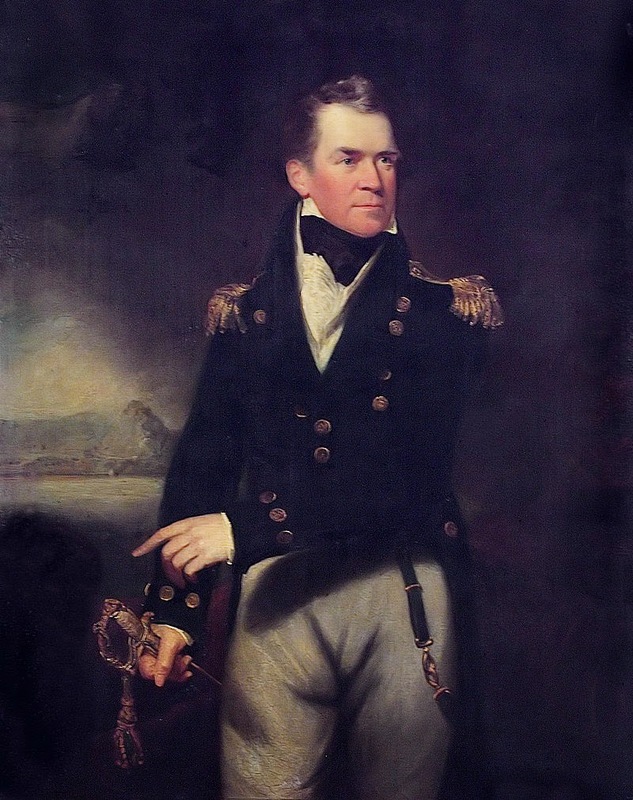 He served under Yeo again aboard HMS Southampton (32), Sir James' last vessel before coming to the lakes in 1813. And often those who had heard the rumor that we were on the prowl would switch into long clothes and slip right off the reel, not be seen or heard from again till the coast was clear, that is to say we had set sail. 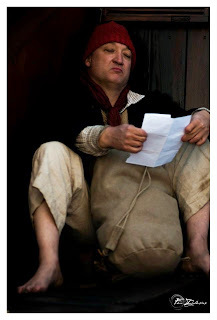 So with very little to tender we would crack on and start to careen from tavern to pub the nasties, and as I recall rarely did we find Jack or Joe, but more likely a spitkid full of dogsbodys begging for hanky panky to stay warm if it was cold. And lord we promised them a easy number, warm food and signing bonus and prize money. So with a fair amount of hogging, even the worst chaffered up enough to make a landsman and on occasion with time if they didn't die or get whittled down make a damn fine and able seaman. Once we had this lieutenant who told me of when he first sailed from Portsmouth, his wife was pregnant with their second child due but a fortnight past his leaving. And having been away the short side of three years, he received news upon his return to Halifax of the birth of his new son and of the passing of his beloved wife during birthing. He said that his three children were being raised by his older brother as his own, and his brother had a substantial estate and raised blooded horses, his brother's only wife was lost to some kind if fever as he would recall. He once told me of the day that he and his brother were saddling horses to go have a chase with the dogs, he told me that a his stud horse cow-kicked his brother in the face over and over again till he was gone. He buried his only brother next to his own wife, the mother if his three children on the south side of a hill. He said that when I leave the sea that I should visit him on his new estate and we could take out the hounds for a chase, we still post to each other but I don't believe I shall ever saddle up with him. “This book aims to fill the gap between social and maritime history.” That is the first sentence of the book’s introduction. Having said that- it’s not light reading. Lincoln has approached the topic is a scholarly and academic manner. 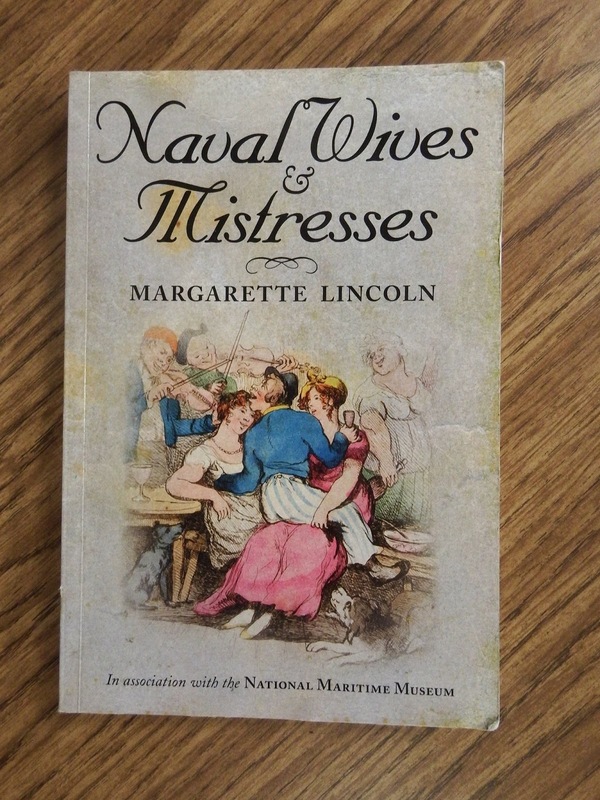 Lincoln basically divides female society in regards to the British navy into three segments, the Aristocracy, the “Middling–Sort” and the “Laboring and Criminal classes”. She deals with each segment individually. Due to the scarcity of written material from the “Laboring and Criminal Classes” most of the information here is implied from other sources. She does a good job of covering various forms of welfare and charities that were available to the wives of sailors during the period. While it’s not a riveting “page turner” I do recommend this book for the women of the Acasta. I would recommend first, however, “Jane Austen’s England” by Roy and Lesley Adkins. 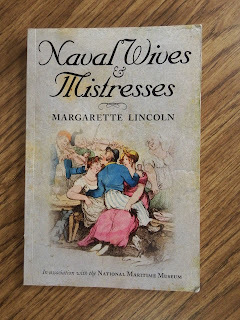 These two books in conjunction would give a nice background for anyone portraying a sailor’s wife in the Acasta time period. The British force stationed in Boston bay in the beginning of December, 1814, consisted of the 50-gun ship Newcastle, Captain Lord George Stuart, 18-pounder 40-gun frigate Acasta, Captain Alexander Robert Kerr, and 18-gun brig-sloop Arab, Captain Henry Jane. On the 11th, when this squadron was cruising off St.-George's shoals, the Newcastle parted company, to reconnoitre the road of Boston. On the 12th Lord George discovered lying there the 44-gun frigate Constitution, Captain Charles Stewart, in apparent readiness for sea, and the Independance 74, with her lower yards and topmasts struck. The Newcastle then steered for Cape Cod bay ; where, in a few hours, after having grounded for a short time on a shoal, she came to an anchor. On the 13th one of her men, from a boat sent on shore, deserted to the Americans. On the 16th the Acasta arrived, and anchored near the Newcastle. 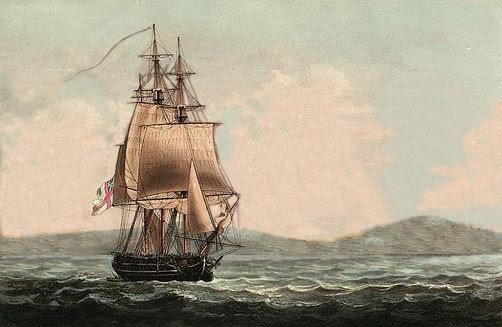 19 Dec 1814 - Leander sailed from Halifax bound off Boston, and on the 24th fell in with the Newcastle and Acasta. 22 Dec 1814 - Arab reported to the Leander, Newcastle and Acasta that the Constitution had sailed from Boston on the 17th inst. who departed in search of the US frigate. 28 Dec 1814 - the Leander, in company with the Newcastle and Acasta, captured the celebrated privateer Prince de Neufchatel. The captors of an enemy Ship of War, national warship, privateer or letter of marque, were entitled to a bounty known as HEAD MONEY; this allowed that £5 would be paid for every member of the enemy crew whose was aboard the prize at the commencement of the action. 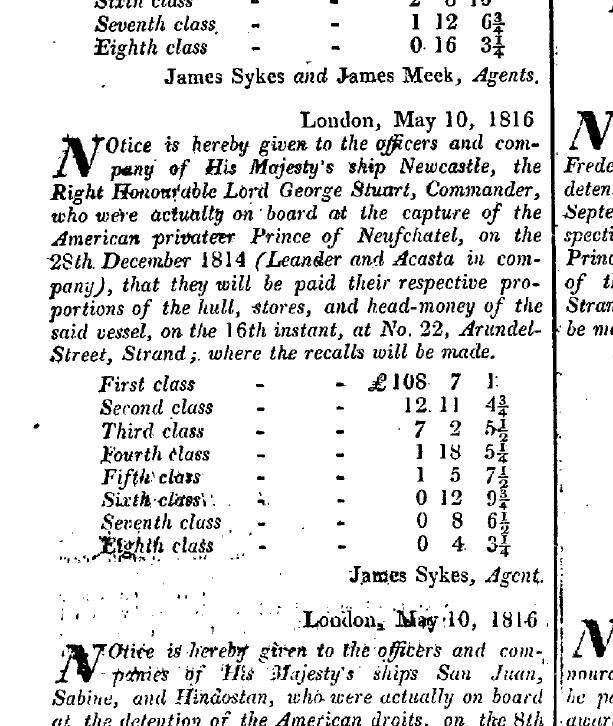 The three documents here comprise the HEAD MONEY papers for the capture of the American Privateer Prince of Neufchatel during the War of 1812. Before a claim could be placed for Head Money the vessel in question had to be condemned in an Admiralty Prize Court, a sworn statement had to be taken from the surviving members of the captured crew as to the number of men aboard. Having obtained these documents the Prize Agent, acting for the captors, could forward his claim, as shown below. 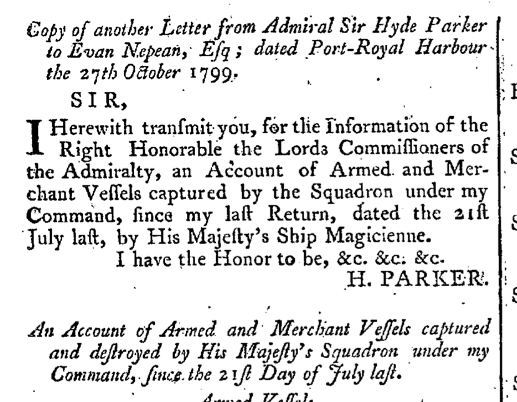 Proof of Condemnation of the said American Ship of War The Prince of Neufchatel in the High Court of Admiralty. Lists of the said Ship's Companies certified as usual. The Vouchers produced, being conformable to what are required by Act of Parliament, let a Bill be made out for the Head Money claimed. Extracted from the Registry of His Majesty's High Court of Admiralty of England. Our Sovereign Lord the King against the said Ship her Tackle Apparel & Furniture and the Arms Stores and Ammunition therein taken by His Majesty's Ship Leander, Sir George Collier Bart, Commander in Company with His Majesty's Ship Newcastle and Frigate Acasta and brought to Penzance and against all persons in general. And moreover pronounced the said Ship to have been a Ship of War in the Service of the Enemy, and that there were alive and on board the same at the commencement of the Engagement in which the same was taken one hundred and thirteen men. Statement by the Officers of the Prince of Neufchatel as to the number of crew. - And that he the said Deponent Nicholas Millen, with William Stutson late first Lieutenant and John Martin late second Lieutenant taken as aforesaid And the three Deponents further said that they were actually alive on board of and belonging to the said American Privateer at the Time She was taken as aforesaid one hundred and thirteen men including the Deponents. Sworn at Asburton in the County of Devon the twenty eighth day of February one thousand eight hundred and fifteen. Once I was working in Portugal. At lunch there were a couple of choices, one of which was cod. One of the Portuguese crew assured me it was delicious. It was horrid. It wasn’t just frozen cod- it was salted cod. One of the Portuguese guys later told me salted cod was the favorite food of the Portuguese. I’d often wondered since how a country on the ocean (and having access to fresh seafood I assumed) came to be so fond of a slated fish from so far away. This book told me why. 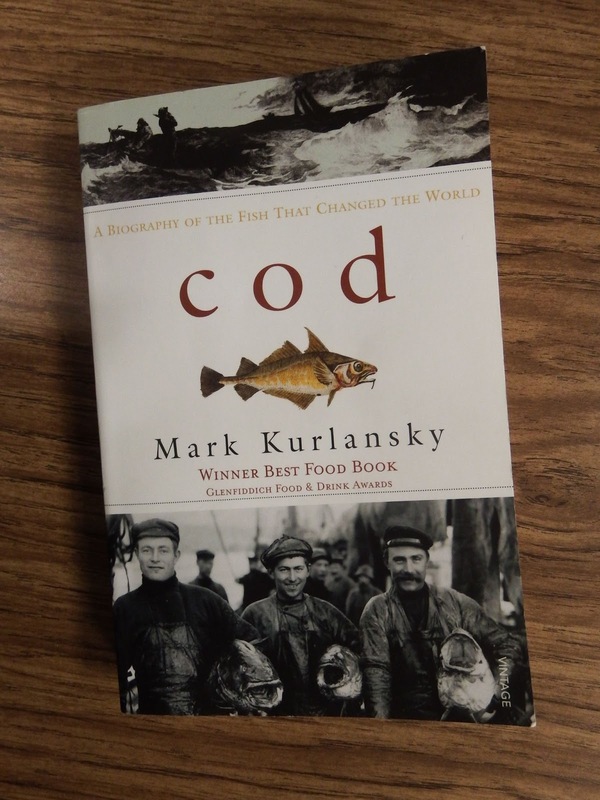 Kurlansky takes the history of humans and codfish from their beginnings up to the late 1990s, when the book was written. Ever heard of the Cod Wars? Me neither, but they happened, and they were a big deal at the time. I between chapters the author throws in little edible tidbits about cod- usually a historic recipe. He covers the basics, although not in great detail, about cod fishing- both historic and modern. If an Acasta had a back-story of being a former fisherman, or coming from a fishing family this would be a book I recommend. Heck, if you like to eat fish, or are just interested in odd history I recommend this book. It’s well written and an easy read. It even encouraged me to check on where codfish stocks stand today (Spoiler alert- the picture is not as bleak as they did when the book was published). FROM SEPTEMBER 26 TO OCTOBER 24. Sept, 28. Arrived the Venerable, of 74 guns, Captain Hood; and the Russel, of 74 guns, Captain Cuming, from Sir J. Saumarez's squadron, off Cadiz. Also the Tartar, of 36 guns. Captain Walker, from off Havre; and the Glenmore, of 36 guns, Captain Talbot from Plymouth. Sailed the Mondovi sloop of war, Captain Duff, with dispatches for Egypt. 29. Arrived the Arethusa frigate, Captain Wolley, from Madeira. Oct 1. Arrived the Audacious, of 74 guns, Captain Peard, from Sir James Saumarez's squadron. 2. Arrived the Fortunee frigate, Captain Lord A. Beauclerc, from attending his Majesty at Weymouth; Acasta, of 36 guns, Captain Fellowes, from the West Indies, last from the Downs; and the Union cutter, Lieutenant Rowed, from a cruise. 3. Arrived the Wasp sloop of war, Captain Bullen, from a cruise; and the Racoon, Captain Rathborne, with a smuggler, which the captured off Beachy Head. 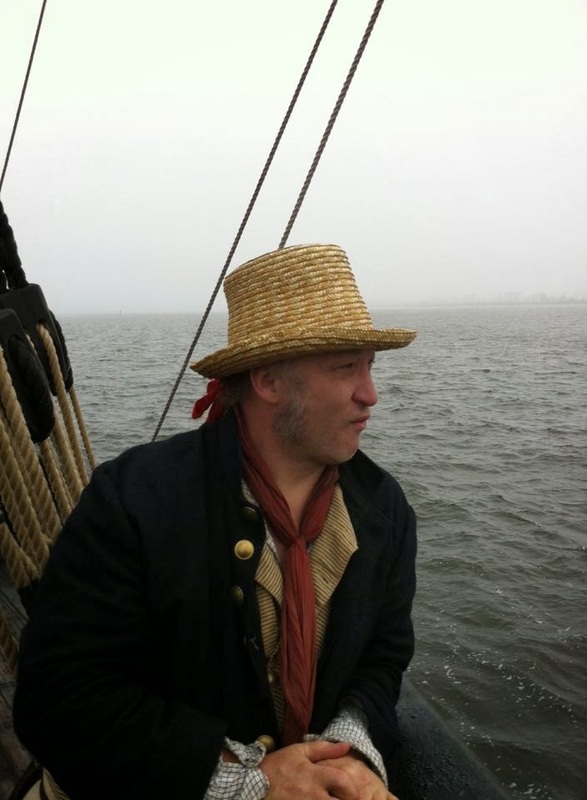 Sailed the Union cutter, Lieutenant Rowed, on a cruise. 5. 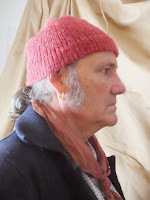 Sailed the Barfleur, of 98 guns, Rear-Admiral Collingwood, Captain Ommaney, to join the Channel Fleet; Tartar, of 36 guns, Captain Walker, for Cork, to take the trade from thence to Jamaica; and the Constance, of 24 guns, Captain Mudge, with General Count Viomenil and suite on board, for Lisbon. 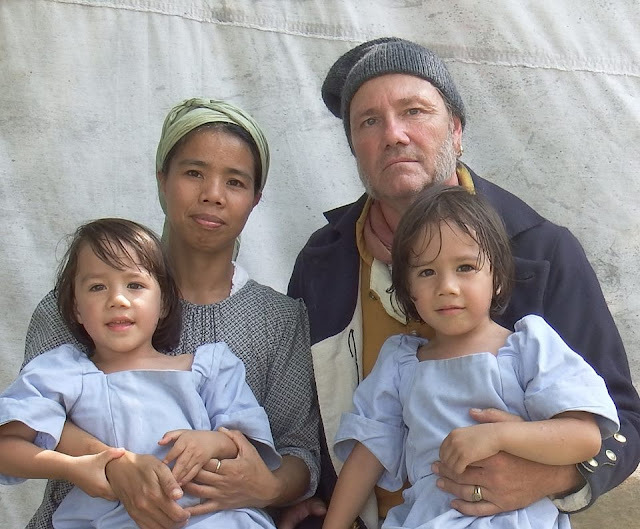 Reenactor Mark Miller volunteered to act as wounded after every battle and his fantastic performances always drew large crowds of public to the British hospital tent. I'd like to publicly thank him for his assistance, his help contributed greatly to the success of the British Hospital demonstration at New Orleans. 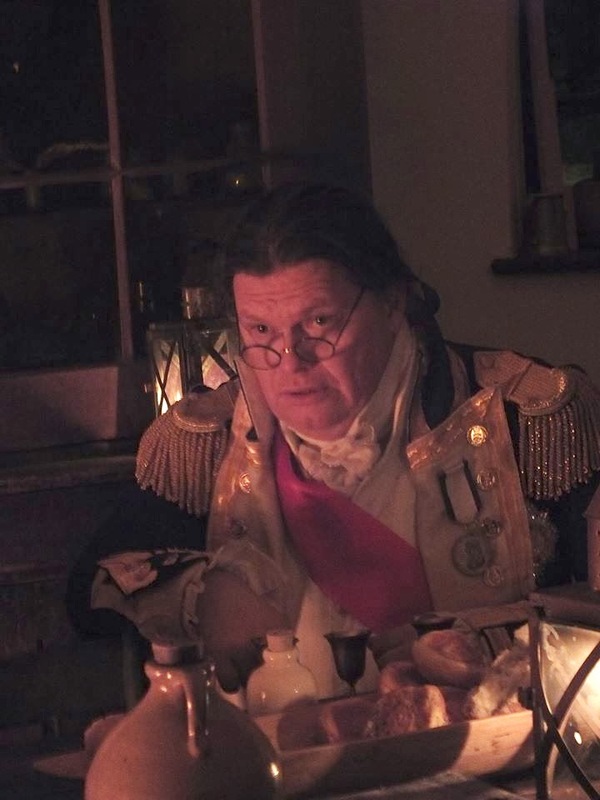 The crew of HMS Acasta ran the British Field Hospital at the 200th Anniversary of the Battle of New Orleans in Jan. 2015 located in the town of Chalmette in St. Bernard Parish, LA. The Hospital was open after every battle that took place that weekend and was intended to serve as a tribute to the men on both sides of the line that fought and died in that final battle of the War of 1812. 278 Men for a Frigate? A well made video about the division of men aboard a Frigate during the Napoleonic era that you might enjoy.Special thanks to Acasta N. Johnson for bringing this video to our attention. It has been nigh onto two years since last we met. Much water has gone under the keel since then. You will no doubt recall that when our good ship and Captain took little Boney s ship Avanture, I was Placed aboard as part of the prize Crew. Oh how I Hated this at the time, having grown Fond of my old chums aboard the Acasta. But such is Life as they say and I reckon it was for the best. We returned to Portsmouth with our Prize and believe me when I tell you the Coin did not burthen my Pockets for long. At the urging of the Cockswain I did entrust a few Quid to my old Solicitor back in Bristol. My girls, when they come of age, will appreciate that I did. I sailed aboard the Royal Edward- a sharp little Brig of twenty-eight guns on September last. She is fast and keen and a joy to sail-how she cuts through the water. It would make your spirits rise. But the real news that I want to share with you now is this. You may recall how I always longed to be on the gun crew while aboard Acasta. I have at last got my wish. Our lieutenant said he saw me as a lively little fellow and that I couldbe better served on the guns than as a Topman- always there on our old bark and my new one as well. So off I go to work on the twelve pounders. It was hot work and long days let me tell you. Our Captain, Reynolds, says within ear shot of the Gunners that he would have us the fastest Artillery in the Fleet or see us all drop dead at our guns from fatigue. This was no idle boast. Work and work we did. He, the Captain, has paid for powder from his own pocket that we might fire the Guns more frequently than is ordinarily required by the Service. He believing that dry Firing alone does not ready the men for Battle. All the while he stands by with his time piece, “Not good enough! Faster!” he cries, and faster we go There is much Labour and shouting and sweat. Much as in actual Battle- without the Blood under our feet, of course. Our hard work has paid off though aswe are Each given an extra Gil of rum and two of Grog for our pains. You would think me quite deef after a month or two of this but the Deck Officer had us stop our ears with tow and wax. None of the Boys liked this at first but now I believe to a Man they are Grateful for this kindness. He says it is no Kindness but makes an effiecient crew- for how in H- can we hear his curses if we are deef as a stone The Captain in his exortations to us has us believe that a smaller Ship may yet defeat a larger one by way of a disciplined gun crew. And by Jove after a time at this I believe him right. Our gun is numbered 7, witch of course is good luck and I believe She favours us. We have on our Crew a red Indian from America- taken from a Yankey Whaler and a black Jamaican. Butwe are all well drilled and Disciplined and if I may say it the best Gun crew on the entire Ship. We are excused from some other duties as Artillery men and are much favoured by the Captain. Which causes some jealousy from the other Boys. Also we have been given new Cloathing and all green ribbons for our Hats to mark us as gunners. You would think us the Captain's Launch crew if you saw us lined up on the Deck as smart a show as we make! I have another surprise for you. I know you do not forget the beautiful Negress with the Cinnamon Skin and yellow eyes- I wish I could see the smile on your face that I know must be there as you read this. Oh the memories! I was walking through the Market whenlast we were in St. George in Bermuda. Often I had thought of Her whilst laying in my Hammock at night when I learned we were bound for this place. As I and some of my Mates walked though the Market I hear a cry from that Angelic throat- “Char Lay Char Lay is it you for true.” She leaps into my arms verily knocking me to the cobbles. When I work my way our from under her embraces and kisses you would have given your Grog ration to see the looks on those old Tars faces. “How now Carpey, What is this?” This is their name for me, but that is a story for another time. But on to Margarite. Oh how this unexpected meeting set my heart to pounding. As I helped her up I look into those yellow Eyes and, Jesus help me, if I Did not fall in love all over again. She is kissing me again and I can feel my face Pulse. At length I look around to see if the whole World is looking at our Spectacle and standing directly behind me is the biggest, blackest Man you have ever seen, staring, with a Countenance that would surely melt a Stone, Directly into my eyes. Margarite says with a veritable squeal, “Char Lay, you must Greet my new Husband, Marcelle”. I can see Tell you at that instant I would rather have faced the entireFrench fleet alone than to have been Standing there looking up into the Eyes of this Giant! Sweet weeping Jesus, I am a dead Man. Even the other boys stood in silence, no doubt ready to Flee back to the safety of the Ship at any moment. This Behemouth suddenly lifts me into the air Squeezing me so tightly against his Chest that I could not breathe if I had wanted to. But that was not a Concern at all. The fear that Siezed me at that instant had stopt all thought of anything and my brain clean forgot to tell my lungs to work as God had Ordained. “No! Yes!” Said I. Then praying that my death would be swift but fearing it would be very slow and painful. Suddenly he laughed a laugh that echoed down the Street and through the Crowd, which had now given us a very wide Bearth. Marcelle stops and looks at him and says, "Not to worry, little Englais man. Marcelle is a friends to the Sailors". He picks up the well named Tote and carries him under his arm the rest of the way to the ale House. All ended well, and I must tell you now, having time to reflect, that this ending is for the best. But, oh, how I do pine after those yellow eyes and that sweet voice of the finest silk. Maybe in another life. I fear I have rambled too much and as paper is dear, I must close for now. I trust you are well and in fine health and spirits. I miss you leading us in our old chantey songs. None of the Boys on board the Edward sing with the same lust and joy as our old Ship’s Carpenter. p.s. This Letter was taken down by Midshipman B. Hillman as told to him by Mr. Grierson, Able Seaman. He says he continues to Work on his Letters as you taught him and hopes that his next Letter will be in his own Hand. There has been a great deal of celebration, what with Christmas and our recent captures. We have been back and forth to the Poictiers several times to dine. It would seem that my exposure to the winter air above decks and in the longboat has laid me open to a newly formed cough that I cannot get rid of. I am quite cross about it, for there is far too much to be done for me to be sick. And I fear that even Vasserman will attest that I can be a bit unpleasant when I am, myself, ill. It is attended with a fever and I am quite tired and have a raw throat from all the damn'd coughing. It is, I fear, the enemy despised, the much dreaded cold. Vassermann is ditirmined that I be bundled into my cot with every blanket available to 'break' my obstructed perspiration. He has placed a blanket 'round my shoulders every time he has passed by me at my desk this morning. To ease my cough, I have been dosing myself with a private mixture of equal parts honey, lemon-juice and sugar-candy. A table-spoonful taken by mouth at my pleasure does help ease the cough. Baptiste, my mate, knows well enough to stay away from me unless his assistance is requested. Instead, I have given over my daily duties to him in an attempt to keep him from feeling any obligation of calling upon me in my current state. 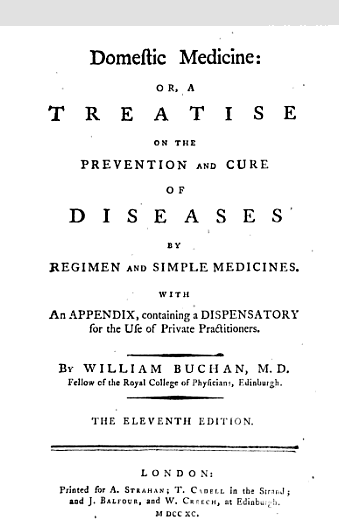 DOMESTIC MEDICINE or, a TREATISE on the PREVENTION And CURE OF DISEASES BY REGIMEN And SIMPLE MEDICINES. WITH An APPENDIX, containing a DISPENSATORY for the Use of Private Practitioners. 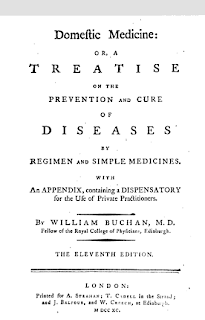 By WILLIAM BUCHAN, M. D.
Fellow of the Royal College of Physicians, Edinburgh. 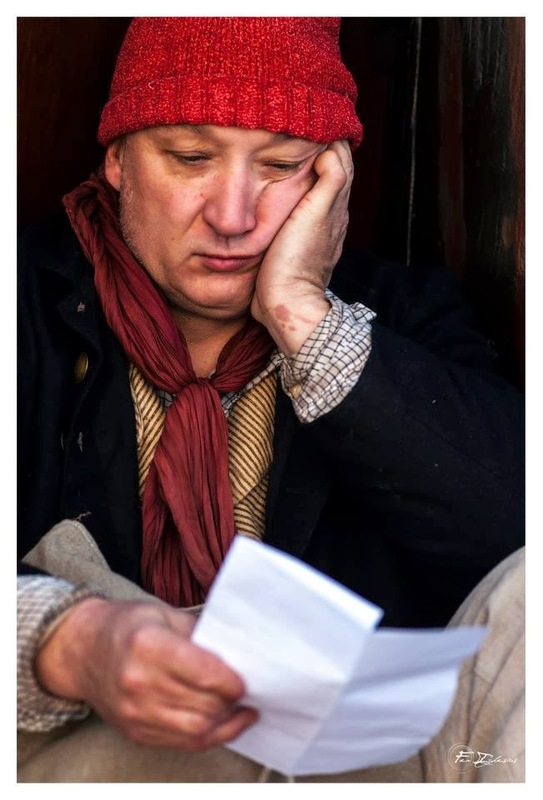 When oppression of the breast, a stuffing of the nose, unusual weariness, pain of the head, &c. give ground to believe that the perspiration is obstructed, or, in other words, that the person has caught cold, he ought immediately-to lessen his diet, at least the usual quantity of his solid food, and to abstain from all strong liquors. Instead of flesh, fish, eggs, milk, and other nourishing diet, he may eat light bread-pudding, veal or chicken broth, panado, gruels, and such like. His drink may be watergruel sweetened with a little honey; an infusion of balm, or linseed sharpened with the juice of orange or lemon; a decoction of barley and liquorice, with tamarinds, or any other cool, diluting, acid liquor. Above all, his supper should he light; as small posset, or water-gruel sweetened with honey, and a little toasted bread in it. If honey should disagree with the stomach, the gruel may be sweetened with treacle or coarse sugar, and sharpened with the jelly of currants. Those who have been accustomed to generous liquors may take wine-whey instead of gruel, which may be sweetened as above. The patient ought to lie longer than usual a-bed, and to encourage a gentle sweat, which is easily brought on towards morning, by drinking tea, or any kind of warm diluting liquor. I have often known this practice carry off a cold in one day, which in all probability, had it been neglected, would have cost the patient his life, or have confined him for some months. Would people sacrifice a little time to ease and warmth, and practise a moderate degree of abstinence when the first symptoms of a cold appear, we have reason to believe, that most of the bad effects which flow from an obstructed perspiration might be prevented. But, after the disease has gathered strength by delay, all attempts to remove it often prove vain. A pleurisy, a peripneumony, or a fatal consumption of the lungs, are the common effects of colds which have either been totally neglected or treated improperly. Many attempt to cure a cold, by getting drunk. But this, to say no worse of it, is a very hazardous experiment. No doubt it may sometimes succeed, by suddenly restoring the perspiration; but when there is any degree of inflammation, which is frequently the cafe, strong liquors, instead of removing the malady, will increase it. By this means a common cold may be converted into an inflammatory fever. A story in four parts by Tony Gerard. some of dem carry on dere backs. Dey give me one to carry widt a Spaniard head in it. Dey sign for me to go widt dem on a trail into de mountains. Dat night dey build a fire and some begin to peel de flesh off de heads widt der axes. I am feared dey will make a soup of it- but no, dey just have dem to show dere family all de fellows dey kill. Dey save de skull bones and jaws. De Spaniards call dem Igrots- savages of de mountains. Four de next four years I live among dem. I become good friends widt the fellow dat cut off Gasparia's head- his brother and father also. I live in a longhouse widt de other single fellows, I learn dere language, dere dances. I go to war widt dem. Sometimes against Spaniards, more often against other Igrots. I become very fond of a girl, de sister of my friend. I call her Marie and it make her to laugh. To dis day I have never been so fond of any other woman. Finally I ask for to her for a wife. Her family agrees and we is married. We have a house of our own. We grow camote an tarro an wish to have children. I am very content- but for one ting. I cannot forget my promise to Russo. Finally it torment me so dat I decide to leave- which break my heart because I love Marie so. When I tell her she say dat she will go widt me- she love me too much to do widout me. I am allways telling to her how handsome she is to me and how fond I am of her. Her peoples do not say does tings to one another- and she say she cannot do widout hearing does things from me now dat she knows dem. So we go to leave. De day we are to depart her father come to me. He have a gong dey play for to dance. 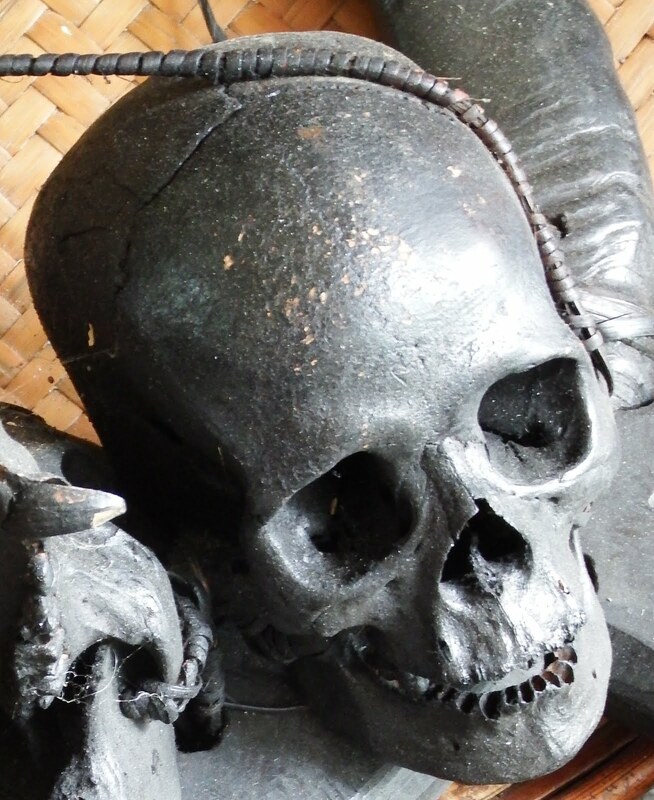 De handles of de gong is made of killed fellow's jawbones. He cut one side loose and give me de jawbone. "Is dat fellow you kick in de balls" he tell me. So we make our way to de sea an steal a canoe. We avoid de Spaniards and go from island to island. Whenever we come to people in dose island I hold out Gasparia's jawbone and say "Espaniard" and we are welcomed. No one like de Spaniards. Finally along de mainland we find a ship- another Dutch ship- but I am signed on and work to pay our passage. A year after we leave we arrive in Louisiana. I seek out Vilot. I tell her of Russo, dat his last toughts was for her and he wish her to marry again- a good fellow. It has been six years now since we sail- and she has never taken another fellow. She tell me dat now she know what has become of Russo she will take another husband. She say dat Russo's younger brother has looked after her for dese last years, and he wish to marry her. She will marry him now she say. "Wot about the lin- lin- go?" asked the topman slowly. The laudanum was having its effect. "Oh, it was a gift from Marie's family"
"A good yarn" drawled the topman "but not very believable"
"Less believable than a sober man falling from de tops of a becalmed ship?" The topman smiled and laid a finger woozily beside his nose. Roberts pretended not to notice. Two broken legs were punishment enough in his book, no need for the fellow to be lashed for drunkenness when he recovered. "An your headhunter wife? Wot become o her?" "She waits for me in Louisiana. We have twin sons now"
"I loves a happy ending..." The topman smiled with his eyes closed. He began to snore softly.